It’s got an 8×8 grid pad matrix that can be used for a variety of production and performance purposes: you can use the pads to trigger sounds and loops, play notes using the four onboard software synthesisers (TubeSynth, Bassline, Electric and Hype), plus you can use the pads to play and create drum and percussion patterns. 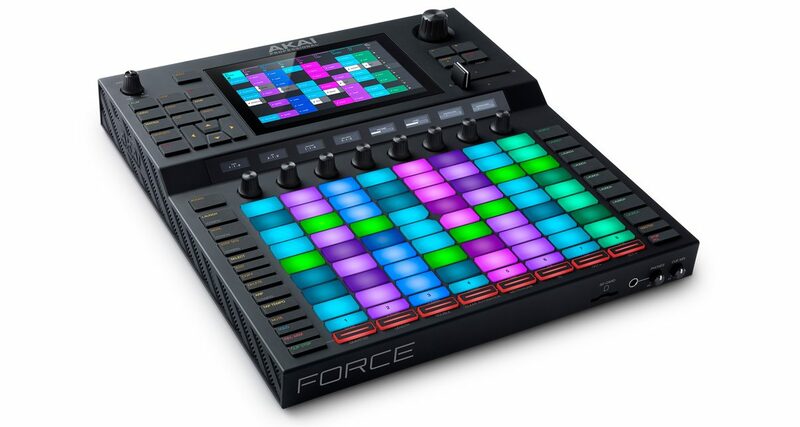 Force has a 7″ touchscreen display that shows you different interfaces, including a mixer for adjusting volume levels and effects, a screen that shows you the sound contents of each pad in the 8×8 grid, as well as a pattern editor for sequencing drum hits and synth notes. Force has onboard time-stretching and pitch shifting, meaning you can speed up, slow down, pitch up and pitch down sounds – great for remixing and improvising with loops – and you can use the touchscreen to edit audio, chop samples and further tweak sounds. There are eight touch-sensitive knobs at the top of the grid with OLED displays that show you what parameters you’re tweaking. Other controls include grid navigation buttons, transport controls, and additional grid matrix buttons like Mute, Solo and Record, plus Launch buttons that let you trigger entire rows of audio clips at the same time. Round the back the Akai Pro Force has two combo mic / line / instrument TRS inputs, two USB sockets for plugging in thumb drives, an SD card slot, a 2.5″ SATA bay for connecting a hard drive to increase storage capacity (it comes with 16GB onboard), an Ethernet jack, 1/4″ master outputs plus two more 1/4 outputs, 1/8″ Midi in, out and thru jacks, plus four 1/8″ CV gate jacks for hooking up analogue synth hardware. It also ships with 10GB worth of loops and samples to get you started straight away. 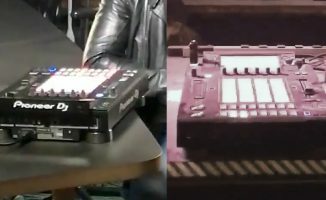 Akai Pro says that Force will be compatible with Ableton Live come March 2019, and that you’ll be able to see and control Live’s Session View grid right from the unit itself, including mixer controls and crossfader assignments. Live device parameters will also be controllable via the touchscreen and rotary encoders. Akai Pro also says that by March 2019, Force will have Splice integration built in. Splice is the online loops and samples store that’s got tones of royalty-free sounds ready to be used in your productions, and Akai Pro says that you’ll be able to access your Splice library on Force’s touchscreen via WiFi, no computer necessary. Force looks to be a solid device for music making and performing, sans laptop. From what we’ve seen so far, it’s like Akai Pro took the best bits of Ableton Live as well as its companion Push 2 controller and distilled them all into an all-in-one system for both studio and stage. 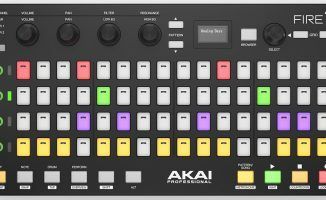 This shouldn’t come as a surprise: Akai Pro, after all, is the company behind some of the most beloved Ableton Live grid controllers, including the now-legendary APC 40, APC 20, and even Ableton’s original Push controller. 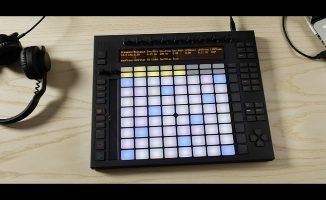 While it’s meant to be used standalone, forthcoming Ableton Live integration means Live users will be able to use it as a Midi controller for Ableton, doubling as a Live production and performance device. If it’s easy enough to use and the included synths and sounds are great, then it’s going to be a (ahem) force to be reckoned with in the DJ/producer world. We can’t wait to try it out, and we hope it will be waiting for us at the Akai Pro booth next week at NAMM 2019. Check the promo video and photo gallery below. 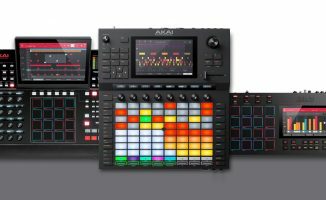 • Akai Pro Force will retail for US$1499 from February 2019. Check the Force site for more details. What are your thoughts on this production system? Think it’s awesome? What kind of music would you want to make with it? Let us know in the comments.